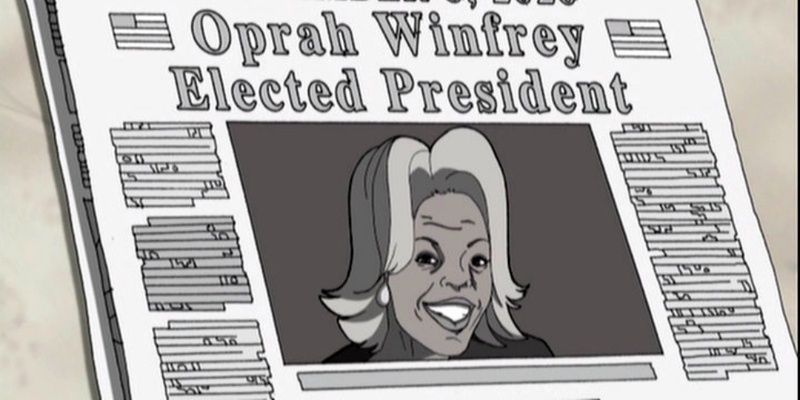 After her soaring Golden Globes speech, a rallying cry has come over the nation calling for Oprah Winfrey to run for president in 2020. 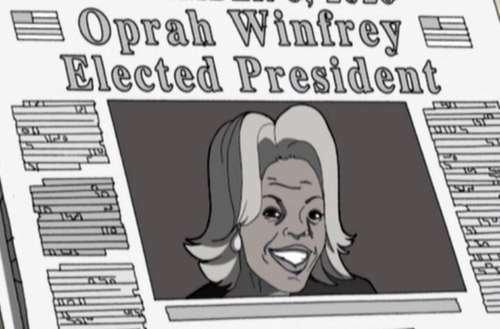 Oddly enough, in 2006, the edgy cartoon The Boondocks predicted a Winfrey 2020 presidency. The Boondocks was an American adult animated sitcom on Cartoon Network’s late-night programming block known as Adult Swim. Created by Aaron McGruder, The Boondocks was based upon his comic strip of the same name and followed a black family, the Freemans, settling into the fictional, friendly and overall white suburb of Woodcrest. The perspective offered by the mixture of cultures, lifestyles, social classes, stereotypes, viewpoints and racial(ized) identities provided for much of the series’ satire, comedy and conflict. The season one episode “Return of the King,” which later won a 2006 Peabody Award, was especially controversial. The program imagined an alternative history in which the Rev. Martin Luther King Jr. was not assassinated in 1968. Instead, he had fallen into a coma. In the episode he wakes up in 2000. King’s nonviolent views become so unpopular following the Sept. 11, 2001, terrorist attacks that he leaves to live in Canada. The plot featured a President Donald Trump.